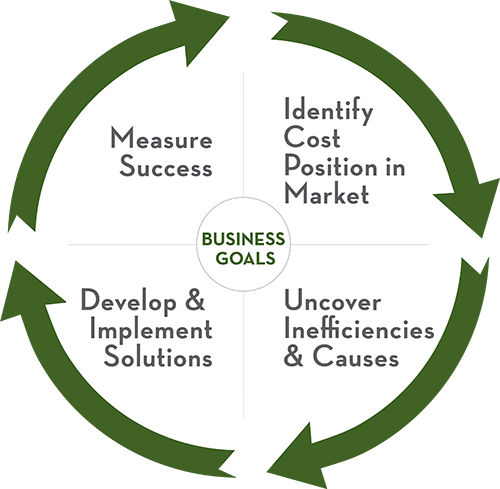 Successful companies pursue continuous improvement. Our Wood Supply Chain Optimization program provides a framework for this improvement. We start with data. And lots of it. Over 30 million transactions a year, in fact. Then, we turn that data into actionable intelligence by developing analytics to uncover inefficiencies in the supply chain and their causes. Then, we use our supply chain experience—220 years in total—to assist in the development and implementation of strategies and tactics to remove inefficiencies and reduce costs. Finally, we provide the tools necessary to measure the results of supply chain adjustments. Once improvements have been implemented, use the benchmark to measure the results of optimization efforts. To understand why your wood costs are higher than market, the Best-in-Class Analysis tool breaks costs out by both product mix and cost component so that specific differences between your facility and better-performing peers can be identified and targeted for correction. Identify where--along the volume curve--a mill outperforms and underperforms the market in order to bring costs into alignment with the market at any volume increment. Identify market share by origin of supply (county/subregion) in order to take advantage of opportunities to lower costs by shifting volumes from high cost counties to lower cost counties.